John Charles Marcus Gates was born "Johann Carl Markus Götz" on the 28 of June 1845 in Nuremberg, Germany. He was baptised at St. Jakob's Lutheran Church in Nuremberg, 6 July 1845. His parents were Christopher Goetz, known in Germany as Christoph Götz, and Anna Sibylla Steffler. John C.M. was the fourth child of six: Lawrence (Lorenz) born 1839, Margaret (Anna Margaretha Carolina) born 1841, Christina Barbara (Christiane Barbara) born 1842, then John Charles Marcus (Johann Carl Markus) born 1845, Christopher (Lorenz Christoph) born 1848, and William J.C., (Johann Wilhelm Christoph) born 1854. Christoph and his mother's family, the Orff's, were feilenhauermeisters, or file makers. Christoph's father was Johann Wolfgang Götz, a Klingenschleifer (bladesharpener) from Gerasmühle, Germany and his mother, Anna Barbara Orff, daughter of Christoph Orff, master filemaker. from Nuremberg. Christoph Gotz's wife, Anna Sibylla Steffler, was the daughter of master spur makers Lorenz Steffler and Anna Margaretha, from Nuremberg. John C. M. Gates immigrated from Bremen, Germany to New York City, New York on 17 August 1864, at age 19. His older brother. Lawrence, had already immigrated and settled in Angola, Steuben County, Indiana in 1853. The year that John C.M. arrived, Lawrence was already in the army fighting the Civil War, not to be back until 1865. So John C.M. must have been on his own or staying with Lawrence's friends when he first arrived. Shortly after coming to the U.S., John C. M. met Elizabeth "Lizzie" Beauvais LaSalle. She was going by her adopted father's last name, as Elizabeth Meyers. According to John C.M. 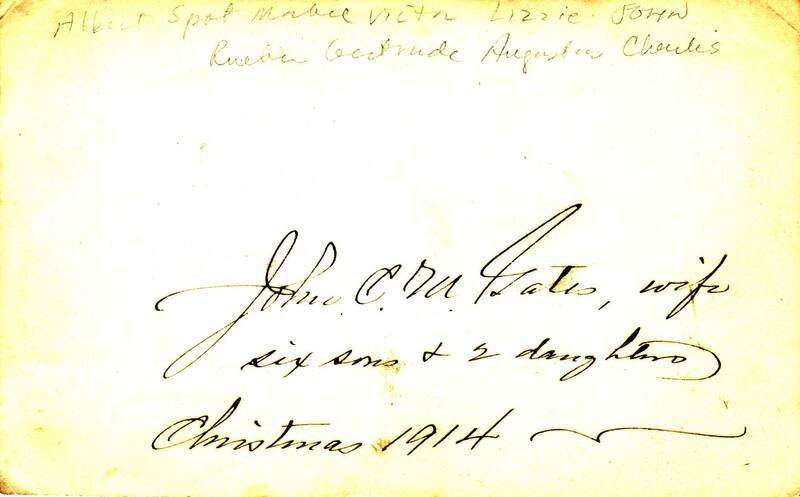 's daughter in-law, Frances Lenore (Myers) Gates, John and Elizabeth met in New Orleans, LA and were married in Louisville, KY. Elizabeth was Catholic and we presume that John C.M. converted to Catholicism to marry her. John C.M. Gates was living in Cincinnati, Ohio by 1868, according to his 1906 passport application. Other details from that passport: John C.M. was about 5'10" tall and had brown eyes and black hair and a "large nose and a medium mouth." We know he had a large moustache! John C.M. 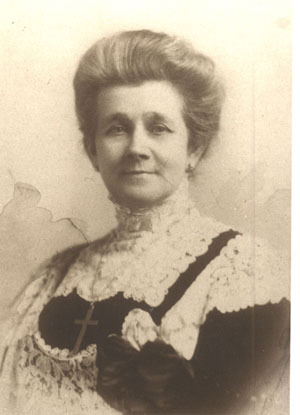 Gates and Elizabeth LaSalle had 8 children from 1871-1890. Gertrude E. born 1871, Charles E.R., born 1873, Victor Frederick, born 1875, John Charles Marcus Jr. (known as John M. Gates or "Spot") born in 1878, Mabel born 1883, Albert E.R. 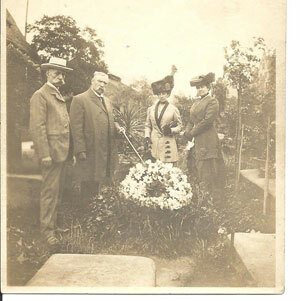 born in 1884, Augustus Joseph Francis born in 1887, and the youngest, Reuben Henry, born in 1890. John C. M. is listed in the 1870 Cincinnati, Hamilton, Ohio census as a clerk in a liquor house, age 25. Since their first born child, Gertrude, is born in August of 1871, they probably married shortly after the 1870 census was taken. 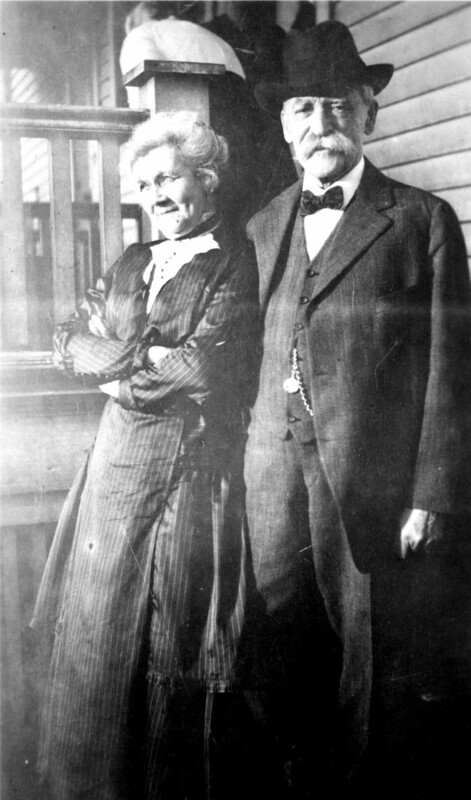 John C. M. was 25 and Lizzie was almost 20 at the time of their marriage. They lived in Hartwell, a small village in the township of Springfield, near Cincinnati, Hamilton County, Ohio and lived for many years at "Old Cardone," the family homestead house where extended family lived, many parties were held, many songs sung and many photographs were taken. 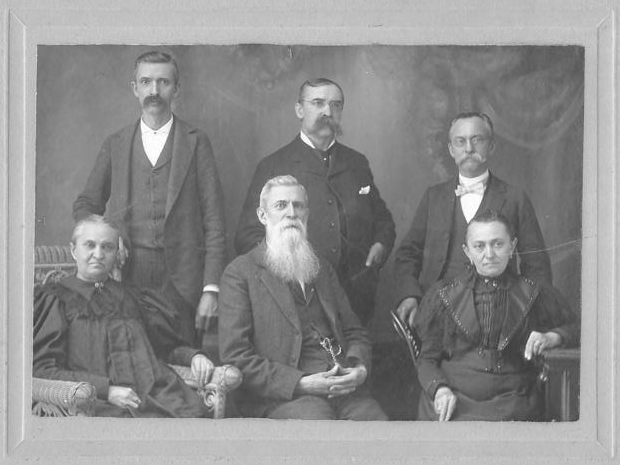 In 1880, in Hartwell, they had 4 children, ages 1-8, and had 2 servants. 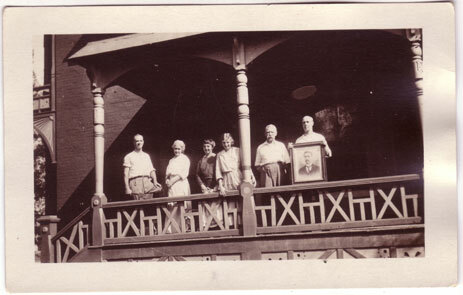 In 1900, in Hartwell, they had Elizabeth's parents, Andrew Meyers, 75 and Barbara (Hemerling) Meyers, 71, living with them. In 1901, their oldest daughter, Gertrude, and her only son were living with them in Hartwell even though her home was in Louisville. While in Hartwell in 1901, Gertrude's son, Victor Eugene, John and Elizabeth's first grandchild, was killed at age 6 after being hit by a train on a trestle bridge. In 1920, their second daughter Mabel, her husband John Romer and their 2 children, Charles, age 3 and John, 1, were living with or visiting John C.M., Elizabeth, and Reuben, age 20, in the Hartwell house, then listed as Springfield, OH on the census. 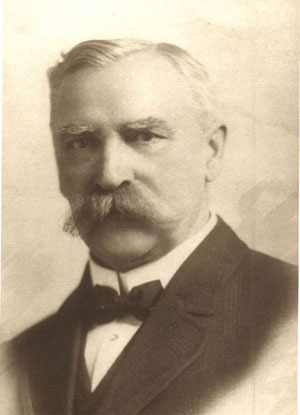 John C. M. Gates worked in the wholesale distillery business. He is consistently listed in directories as working for the same company, W.W. Johnson & Co Distillery from 1878-1895: in 1878 as a clerk, in 1882, as a bookkeeper, in 1884 as a traveling salesman, in 1887 as a bookkeeper, in 1890 with no specific job listed. In 1893 his oldest son, Charles E.R., was also working at W.W. Johnson & Co. Distillery as a clerk at age 20, and in 1895, Victor F., his 2nd son, was working there as a clerk at age 20. In a 1901 directory, John C.M. 's occupation is listed simply as "whiskey." The 1900 census lists him as a "traveling salesman," the 1910 census lists him as a "salesman, distiller," and in 1920, the year Prohibition began, he and Elizabeth are living with their oldest daughter in Louisville, KY and the census lists him as a "retired wholesale distiller." In 1930, at age 85, he is retired, living with his second daughter, Mabel Romer, and her family, in New Rochelle, NY. John C.M. Gates was naturalized 3 Sept. 1876 in the Probate Court of Cincinnati, Hamilton County, Ohio. John C.M. went back to Germany at least two times. He applied for a passport in 1906 and in 1922. Perhaps John C.M. visited his cousin, or the parents of his cousin, the legendary "Gerta Slatter," wife of Horst Slatter, while he was in Germany. We know that he at least had a cousin named Karl Götz because Christina Barbara received a postcard from him in 1913, signed "your cousin Karl." John C.M. 's wife, Elizabeth, died in 1924, 2 years after breaking her hip, and by 1930 John C.M., a widow, was living with his daughter Gertrude part of the time and then other times with Mabel. John C.M. died 22 April 1932 in Louisville, Jefferson County, K, 2 months short of 87 years. His death certificate listed his cause of death as "chronic interstitial nephritis, dilatation [sic] of heart." He was buried in the Vogel Mausoleum in the Catholic Calvary Cemetery in Louisville, KY. In 1930, John C.M. Gates was listed with Ripley's Believe It or Not: "John C.M. Gates of New Rochelle, NY has worn the same collar button for 67 years." That would be a collar button he began using in 1863, a year before he came to America! My mother, Connie Gates Markle, was interviewed in a newspaper article where she mentions owning this very collar button. For more on John C.M. Gates, check the research and the blog pages. 17 Aug 1864 in Bremen, Germany to NY, NY on The "Atlantic"
1878 in Cincinnati, Hamilton, Ohio, USA; "Gates, John C.M.,clk, 18 Sycamore (W.W. Johnson & Co., distiller,), res Hartwell"
1884 in Cincinnati, Hamilton, Ohio, USA; "Gates, John C.M., trav salesman, W.W. Johnson&Co's, res. Hartwell"
1901 in Cincinnati, Hamilton, Ohio, USA; "Gates, John C.M. whisky, h cor Wayne av. & Central Av. (Elizabeth M.)"